In our new book, Protest Kitchen: Fight Injustice, Save the Planet, and Fuel Your Resistance One Meal at a Time, Carol J. Adams and I suggest that your food choices offer a way to challenge the rise of repressive and regressive values. That is, a vegan diet offers opportunities not just to confront factory farms and environmental destruction, but also to impact misogyny, racism, and injustice. 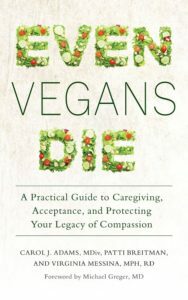 Carol and I started talking about this book shortly after the presidential election, when it occurred to us that there are numerous ways that a vegan diet can inform and strengthen our own resistance efforts. For one thing, at its core, veganism honors compassion and it models values of kindness and decency, values that are under assault by the current administration. Vegan food choices celebrate diversity, challenge the patriarchy and encourage a culture of acceptance and integrity. We look at the ways in which veganism aligns with all aspects of food justice. 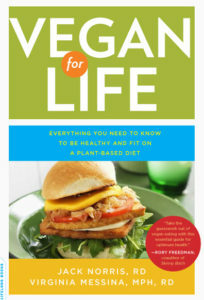 We wanted this to be a practical guide that will help non-vegans take steps toward a more plant-based diet, and hopefully explore some of the other aspects of veganism, too. To that end, the book includes 30 Daily Actions, some of which incorporate recipes. 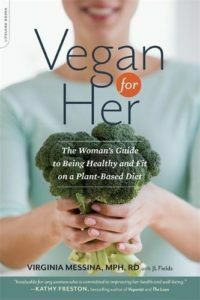 It also has a short chapter on how to eat healthfully as a vegan and we explore the ways in which choosing a vegan diet can counter feelings of stress and depression. To end on a light note, Protest Kitchen includes a “Resistance Feast.” Put together with the help of vegan cookbook author Bryanna Clark Grogan, it features recipes like Stop the Wall Taco Salad, Trumped Up Vegan Cutlets a L’Orange, and ImPeach Crumble. You can see the table of contents and read some excerpts from Protest Kitchen via this free e-book sampler that our publisher created. You can also read more about it in this blog post on Carol’s website. I hope you’ll read Protest Kitchen and will let me know what you think! 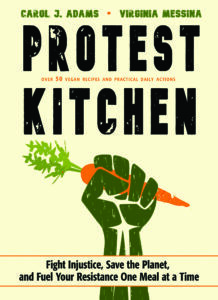 Pre-order Protest Kitchen on Amazon or Barnes and Noble. Library? That’s how I discovered your other books! Also I own Vegan for Her and Vegan for Life–can’t live without it. I reference the Plant Plate all the time. Thanks! My health and my politics are quite separate things. I think you have made some major assumptions about your audience. I am strongly opposed to what your liberal positions are it seems. Just because I am interested in curing my cancers, I do not subscribe to any liberal views except abortion. May I politely ask you to unsubscribe me please? Gary, it sounds like you may have ended up in the wrong place. This is a website devoted to veganism, which is a social justice issue. If you scroll to the bottom of the email you received with this blog post, you’ll see an option to unsubscribe. Let me know if you have problems with that, and I’ll see if I can unsubscribe you from my end. i read the protest kitchen on the sampler site..it is a wonderful book with the most positive message….really enjoyed…. Will there be a new edition of Dietitian’s Guide to Vegetarian Diets: Issues and Applications? It’s a wonderful textbook. Hi! 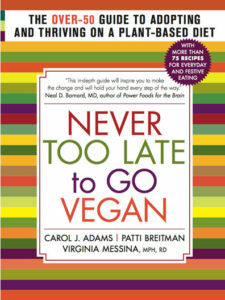 I just read your book and it is giving great ideas to keep on reducing my family’s use of animal products. I have one comment for future editions of the book: please make a better index! As I was reading the book, some recipes caught my attention but it was hard to find them again because they are not in the index (ie: Reuben, hot chocolate). Eventually I figured out that the recipes are in the table of contents but I would expect the recipes (and their ingredients) to be included in the index at the end of the book too! In addition to avoiding animal products, it would be good if ethical consumers avoided products that originate from lands in which the large-scale destruction of tropical rainforests and other natural ecosystems, extermination of plant and animal species and genocide against indigenous peoples and murders of activists are taking place or took place in recent history. I find it unacceptable that so many vegan products contain palm oil and that products that could easily grow in Europe are imported, such as beans from South America and almonds from North America. Manufacturers should use packaging that is easily recycleable.